Home Creativity Taking shortcuts: Guess who gets cheated most? Taking shortcuts: Guess who gets cheated most? 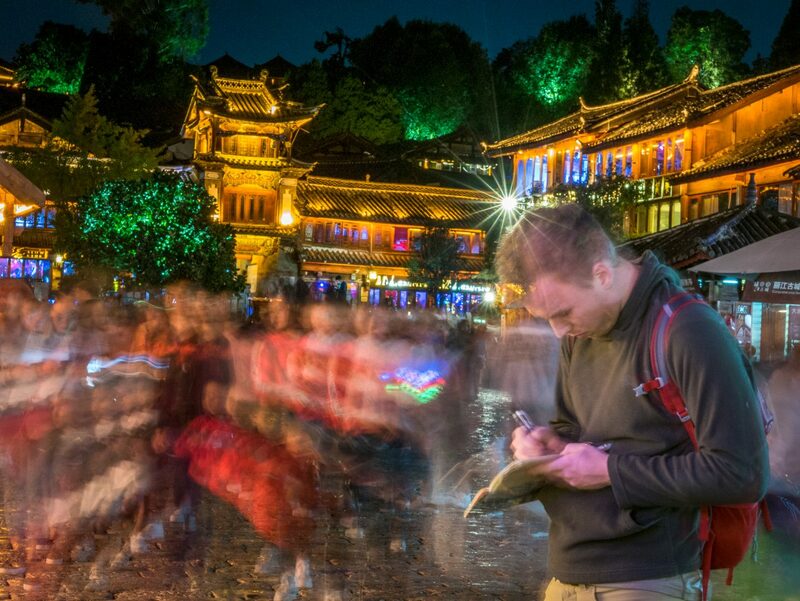 My son sketching a busy night scene in Lijiang, China. I’m a big fan of shortcuts. They save you time and energy. They demonstrate your ingenuity. (You, after all, found a faster way to get something done. Clever you.) They free you up for more important or interesting activities. Which, I’m finding out, isn’t as often as I thought. I had a recent reminder of this when I was in China a few months ago. There, I took up sketching. I was traveling with my son, an artist, and I wanted to be able to do what he was doing, you know, that father-son bonding-type thing. What started as a relationship-building tool soon became an enjoyable experience on its own. But emperors of old could have built entire sections of the Great Wall in less time than it took me to sketch a small section of a city wall. Thus, a little over halfway through our trip, I had a brilliant idea. Always – always – beware when you judge any of your own ideas as brilliant. But c’mon, tell me this doesn’t sound like genius: Instead of sketching say, a statue, I’d speed up the process with some shortcuts. I’d snap a photo of it on my phone then hold the phone beneath a page of my sketchbook (whose pages, lo and behold, were the exact same dimensions as my phone, surely a sign), and trace just the outside edge of the statue’s image through the paper to get the proportions right. That’s all. No copying over all the lines (which, of course, would be unfair). But just that outside edge? Brilliant. Then I’d finish off the rest of the sketch just as I normally would with no outside aids. Such a time saver. Clearly, an innovative approach to shortcuts and drawing. I started to consider my acceptance speech for the inevitable MacArthur Genius Award. In my great enthusiasm, I explained the idea to my son. He just looked at me, his expression lying somewhere on the spectrum from amused to aghast. OK, it was pretty much on the aghast end, a look as if either he’d just stepped into something offensive or he was questioning his lineage. His eventual reply left no doubt: “That’s cheating, Dad.” I could detect disappointment exuding from his pores. Heck, it was just a few shortcuts, not as if I’d worn the same pair of underwear for a week or evidenced some major moral failure. Or so I thought. But from his perspective, it was more than a quicker way to draw. In fact, the notion of wanting to speed up the sketching process itself lay at the heart of his response. To him, drawing was a prayerful and meditative activity. So taking the short cut of tracing only robbed me of the fuller experience. Behind his objection lay an expression of concern: why would I want to miss out on something so powerful and gratifying? Following that line of thinking, my phone tracing would be the equivalent of taking an exquisite seven-course dinner, dumping each dish into a blender, switching on the frappe mode, then downing the whole in a single breathless chug. “So I guess I shouldn’t do it, huh?” I asked in a small voice. The parental expression I received from my firstborn said it all. And guess what? He was right. Smart boy, my son. Takes after his mom. Now that we’re back, I do love having a sketchbook filled with drawings from our trip to China. But more importantly, I love what it took to make that, the flow and the joy of creating. I think back to my favorite moments of the trip such as when my son and I sat side by side on a lonely mountain, lost in the scene before us and the slow, laborious, beautiful process of rendering that scene on paper. Or when I was sketching on my own and a young Chinese woman came up and asked if I’d pose for a photo with her dad who was too shy to ask himself. And yet he wanted a photo with me not just because I was a foreigner (I had several requests almost every day for that reason alone), but because I’d been sketching a particular pond. He cared that I cared enough to draw this one tiny corner of his country. I would have missed that interaction had I taken some shortcuts, snapped the scene on my phone and traced it later. Since I’ve been back, I’ve found another way, a better way, to get my drawings completed faster. It doesn’t leverage any new technology. It allows me to enjoy the process as well as the outcomes. And it doesn’t involve shortcuts or cheating. learning, meaning, practice, shortcuts. Bookmark. What a delightful story! And something we don’t recognize that kills our creativity and enjoyment of the arts: productivity. In our “Instant Ramen” culture, we grow more and more impatient with the simple things and sacrifice all that we gain from them. Thank you for the reminder, Steve. Thanks, Shanna. You’re absolutely right about not just productivity killing our enjoyment but even the pursuit of productivity since, as with shortcuts, they don’t even save us time in many cases. I have to remind myself of this quite a bit!